This time of year, many gardens in my region can look a little tired. Still, if you look hard enough, there are bright spots of color to be found. And, interestingly enough, at least three that come to mind are various shades of pink. Last week I wrote about one of them, the lotus flower. This week’s examples are slightly less ethereal but no less useful (and perhaps more commonly found) in residential gardens: Hibiscus and Joe Pye weed. I first became entranced with the intense color of pink hibiscus right after acquiring my Nikon macro lens (AF-S Micro Nikkor 105 mm/f 2.8) several years ago. On one of my first outings with it, on a hot early August crack-of-dawn trip to Brookside Gardens, I captured this photo. Hibiscus 'Copper King'? Whatever the name of this hibiscus cultivar, it's gorgeous. 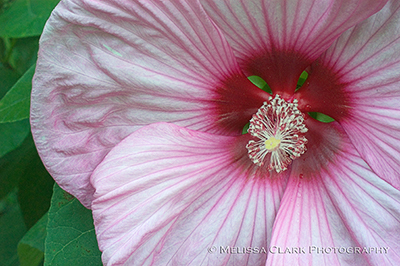 Meet Hibiscus moscheutos, or swamp mallow. The intensity of the flower’s hot pink eye, combined with the pink and white petals and the dark green leaves, was a revelation to me. The blooms, which are quite large, last only for a day, but the shrub (which is what it is, not a perennial), can grow to sizable proportions in the right site. Since then, I have used Hibiscus ‘Sweet Caroline’ and ‘Copper King’ in clients’ gardens where late-summer color is called for. (‘Caroline’ is all pink; check out red ‘Lord Baltimore,’ as well). ‘Copper King,’ which I’ve planted on streambanks of a Bethesda client’s garden, may be the same as the variety pictured above. These plants like moist sunny sites and some of its varieties are hardy as far north as Ontario. Cut them down to about a foot high when you’re putting your garden to bed for the winter and they will come back strong again the following year. 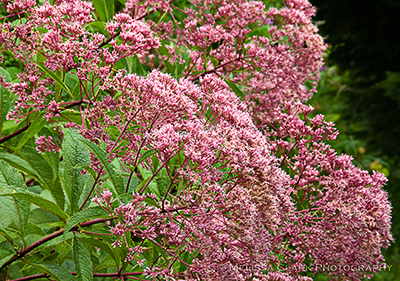 Another late-summer favorite is Eupatorium purpureum, or Joe Pye weed. For years, this American native was neglected in our landscapes, although Europeans discovered it and prized it highly. 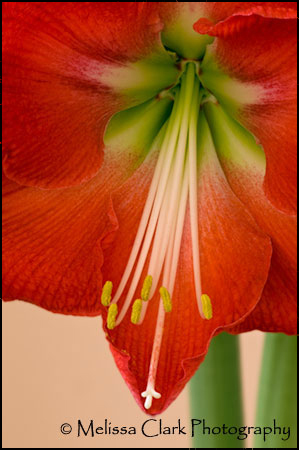 It will grow in either sun or filtered shade (and flower in both), although it prefers sun (and also, like the hibiscus, moist sites). In August its broad flower heads open up, their scent attracting bees and butterflies. Combine it with a bright stand of Rudbeckia for a nice effect in your late-summer perennial border. 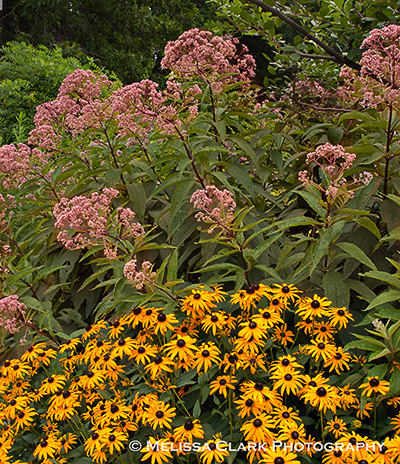 Eupatorium and Rudbeckia 'Goldsturm', a tried-and-true combination, at Green Springs Garden in Virginia. 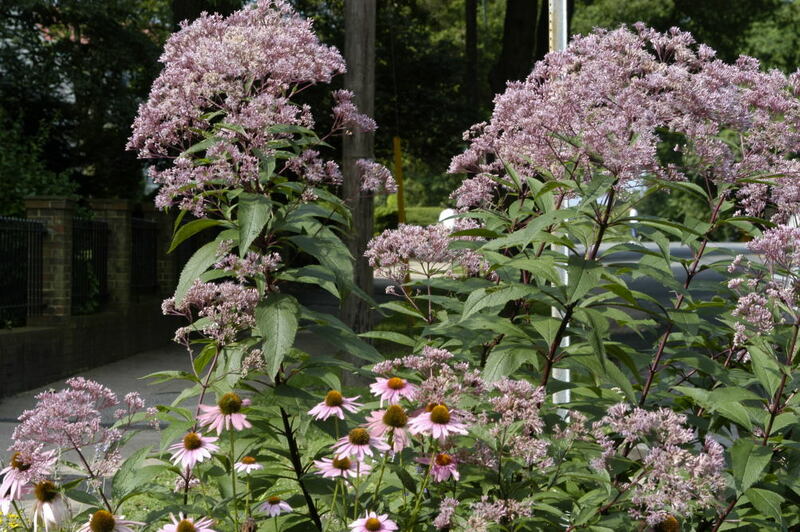 I’ve also seen it grown in a median strip with purple coneflowers, doing remarkably well with no supplemental water. There are many, many more terrific late summer plants, including other pink choices: reblooming roses, Rose of Sharon varieties, dahlias, the coneflowers shown just above, phlox, and even late-summer poppies. I’ll leave it to my readers to suggest others, but for now I will stop with these imposing additions to the garden. Hope you are all “in the pink” as summer peaks this month! 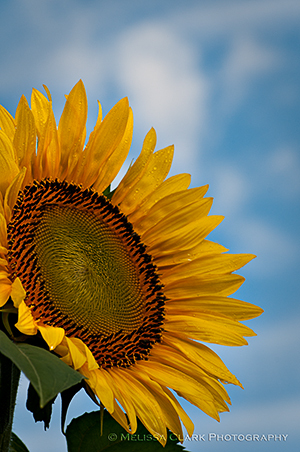 What’s more emblematic of high summer than a sunflower in bloom? Acres of them. 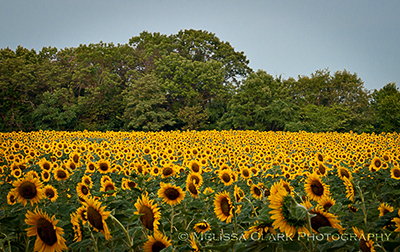 Montgomery County's McKee-Beshers Wildlife Management area attracts photographers like me in mid-summer when acres of sunflowers are in bloom. A couple of summers ago, a camera club colleague of mine shared a photograph with the club that stunned us. A panorama, it showed lines of sunflowers, stretching for miles, and it hadn’t been taken in Tuscany. Instead, the location was within driving distance in our own county – the McKee-Beshers Wildlife Management Area in Poolesville, Maryland. Seems that every year, the county plants acres of sunflowers to lure doves for hunting season (kind of sad, actually, at least in my book), which appear after the flowers are mowed down in September. I’ve been out to the fields three summers running, including last weekend. 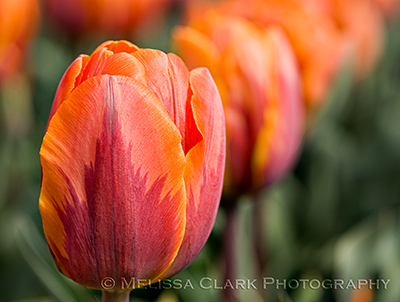 Photographing the flowers takes sensitivity to light conditions and exposure, and has given me an appreciation for what a difference the sky and light can make in the success or failure (so to speak) of my images. The photo at top, for example, was taken on this year’s trip. I was there at first light but because the sky was hazy, I had to work very hard in processing the image to bring out any color in the sky at all, and brighten the yellows of the sunflowers. So for the most part, I stuck to images that didn’t show the sky, like this one. 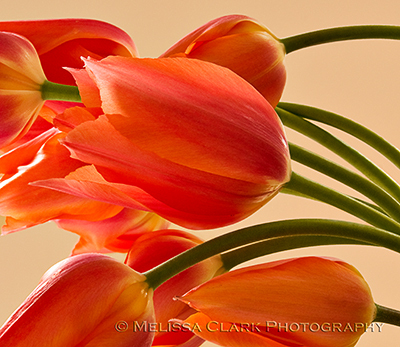 This year's flowers were pretty much at eye level, which helped me photograph them without catching "dead" skies. Last year’s photos are probably the best of the lot. Amazingly blue sky with puffy clouds set off the color of the flowers perfectly, and they were taller than this year, so I had to shoot upwards (not having thought to bring a ladder). 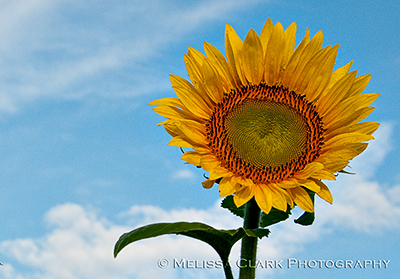 A tall sunflower with a perfect sky behind it, from last summer's trip to McKee-Beshers. 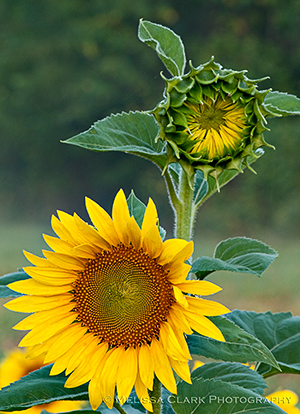 An open sunflower with another one ready to bloom just behind it. 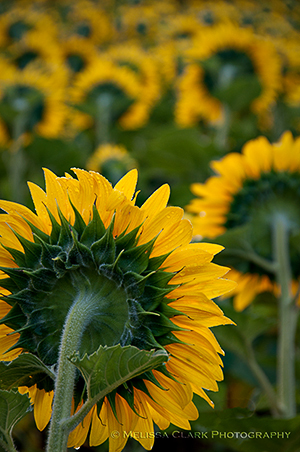 The sunflowers are planted in rows that run north-south but their heads turn towards the sun. The rows look pretty cool from the back as well as the front. 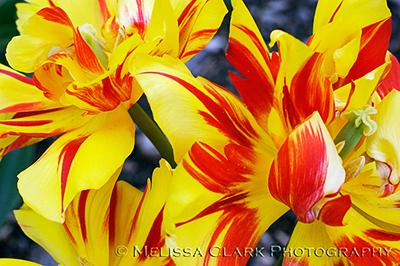 Here are my two favorite images from the 2009 trip, one cropped from the other. 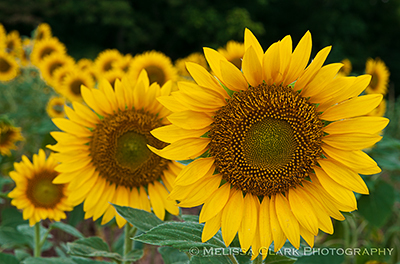 A group of sunflowers rising high above ground level. 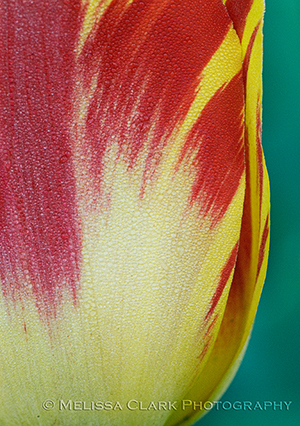 Cropped from the image above. I like the graphic feel of the single sunflower against the blue sky and clouds. 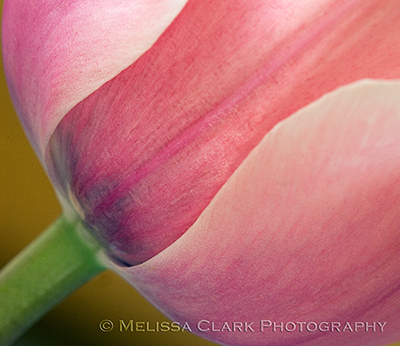 As a card, this is cropped a little differently, more like my "slice" headers. 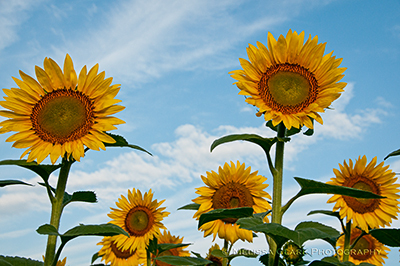 The sunflower is the state flower of Kansas. It’s also practical, tough – and beautiful in bloom. I don’t grow them in my garden, but I’m glad the county makes up for that lack of foresight on my part. Some day, I hope to make it to Tuscany to photograph them there, but until then, I can always find them just up a county road. 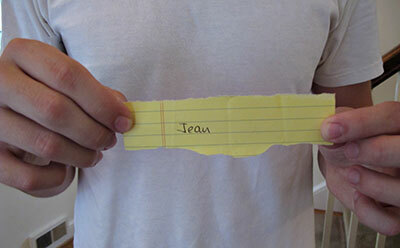 And Jean is the winner! Congratulations to Jean of Jean’s Garden. I’ll be in touch with her to start work on the design soon. Thanks to everyone who entered!